By default, when you send report data to an Excel™ spreadsheet, each page produces a separate Excel sheet. You can merge the pages into a single sheet, but you must then configure the report to avoid problems with alignment and calculation. If the page breaks are not desirable, you can change the page size to a larger custom value. However, creating a huge page can adversely affect memory reclamation and performance. It is often better to use a standard page size to merge the pages into a single-sheet result. Note: If you specify "XLS", and the resulting sheet has more than 65536 rows, the exceeding rows will spill over into extra sheets. If you specify "XLSX" as the Excel format, the size of the sheet is not limited by available memory. In your Swift program, set the mergepages parameter to TRUE in the configureXLSDevice() or configureXLSXDevice() functions to write all data to a single sheet. When you merge sheets, elements such as page headers and group totals might cause problems with layout and calculation. For example, Figure 1 shows how a page header can disrupt the columns. When you merge sheets, the page headers and footers now line up correctly, as in Figure 2. Group totals can also disrupt the column alignment. 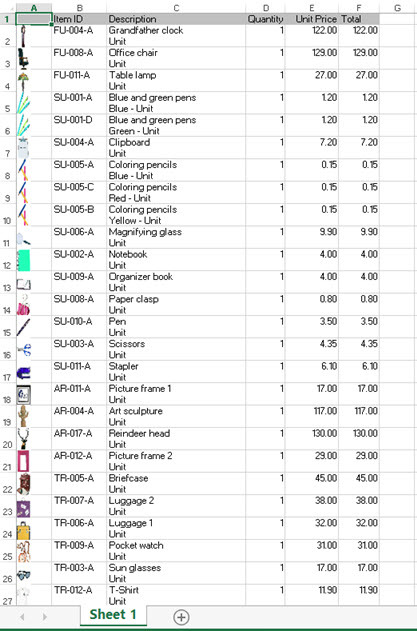 For example, Figure 3 shows a report design document where the "Total" is created from two separate elements: a Word Box and a Decimal Format Box. Note: This problem occurs because of the way the report engine renders a page into Excel output. 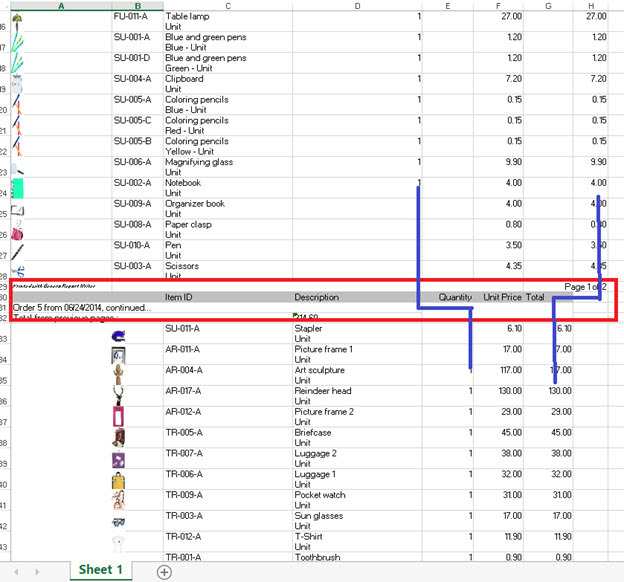 The elements of the original output with floating point coordinates are placed into cells of the spreadsheet in a process called “tabulation”. The edge of an element that appears above the edge of another element in the pixel exact output (for example, SVG) will end up in a row with a lower index than the other element. The edge of an element that appears to the right of the edge of another element will be placed in a column with a higher index than the other element. Tabulation happens for each page as it is streamed, and so the last page might be tabulated in a different way to the first page. Force a page break by adding a vertical box before the total and setting the Y-size of the box to “rest”. The page break moves the total line to a separate page where it is tabulated apart from the main table data. Change the size and position of the total so it does not require new cells. In this case, move the decimal format box to the right so it is directly beneath the product name. Note: You can also increase the page length of the report so it fits on one page. This strategy is not recommended because it can cause performance and memory problems.